Intelligent Weighing Technology supplies a complete range of high-quality laboratory balances, industrial scales, load cells, and weighing accessories. Its leadership team has more than 70 years’ experience in the weighing and measurement business, both in the USA and worldwide. With its 8,000 square foot facility, Intelligent Weighing Technology offers increased product inventory for faster shipping. We appreciate them providing the content below. Have you ever heard of Under Weighing Hooks or Below Balance Weighing? This is a large section of the weighing business that is often overlooked. Of course, many weighing balances have the ability to “under weigh” by the use of a hook that is connected to the weighing mechanism, and much of the time this is used only to weigh items that are too large or bulky to fit on the platform or in the weighing chamber on an analytical balance. In this field, we look for the density of our material by using Archimedes Principle of weighing the item in air and then in a liquid. One of the largest industries to use this method of testing is the construction business. Customers use this for identifying the density of anything from Bitumen in road surfaces, concrete, to core samples taken from the ground where construction is going to take place. Here, an end user will weigh the core sample suspended from the under-weighing hook, (normally in a basket with holes) in air and then, using a bath of water, suspend the core in the water and weigh it again. (Still in the basket). Seems a bit complicated? But, with use of a suitable “Below Balance Weighing” device, these measurements are easy to accomplish. The balance will not see the weight of the water, just the effect of the water on the object. Note! For correct results, the water should be free of contaminants and the temperature of the water is a variable that should be taken into account. 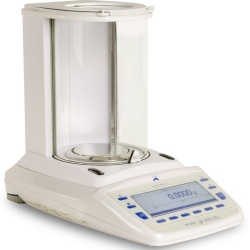 Density is required for many industries, all you need to do is know which balances have under-weighing capability or, in the case of analytical balances, which ones can have the density kit fitted. The more sophisticated balances have a density program included, so an end user can easily input the data he/she needs to get an accurate and consistent result. Many low capacity balances, such as analytical balances, have density kits that can be purchased; simplifying the process even more. In fact, the more sophisticated electronic balances have a density program to lead users through the process. So! That is density in solids. There is some scratching of heads when we talk about densities in liquids. How can you do that??? Well, instead of suspending the object in a liquid such as water, you suspend an object of a known weight in the liquid to be tested, sometimes known as Gravimetric Displacement. used to calculate the density. To recap, the area of density determination with digital scales involves terms like “undeweighing” or “below balance weighing”. Please contact the sales team at Central Carolina Scale (919) 776-7737 or complete our Request a Quote form on the website for assistance with a particular application.